M. "Nicole" Williams-Lewis of Keller Williams Realty to host a free workshop for first time home buyers. Speakers cover the home buying process from start to finish. Presenters are housing industry experts from leading companies in the area. JACKSONVILLE, Fla. - June 26, 2017 - PRLog -- M. "Nicole" Williams-Lewis of Keller Williams in concert with Freedom Mortgage, North American Title, SafeTekk Property Inspections and others to offer a free workshop for first time home buyers in the community. The event will take place July 15, 2017 from 11:00AM - 1:30PM at 7973 Old Middleburg Road South, Jacksonville, FL 32222. The workshop will focus on the steps involved along the path to home ownership. The professionals presenting at this event consistently dedicate themselves to helping others achieve their goals of home ownership. The businesses they represent have strong customer support and are among some of today's top corporations. 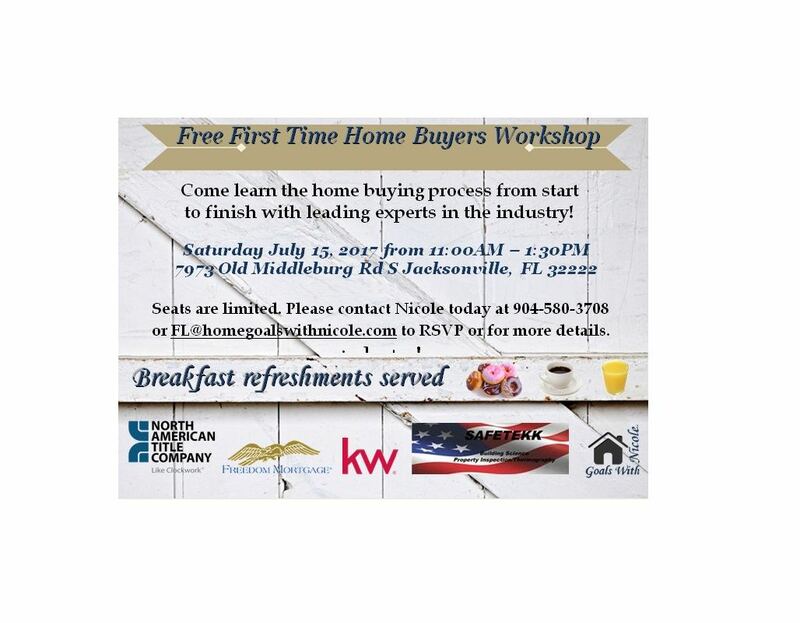 Seats are limited so please RSVP today at https://www.eventbrite.com/e/free-first-time-home-buyers-workshop-tickets-35707331590 or by emailing FL@homegoalswithnicole.com. For more information, please visit www.homegoalswithnicole.com or contact M. "Nicole" Williams-Lewis, Program Coordinator and Florida Realtor®, at (904) 580-3708. M. "Nicole" Williams-Lewis of Keller Williams is excited to take part in this premier event and to show continued support for the services built on shared values to include awareness of home ownership opportunities for all. M. "Nicole" Williams-Lewis of Keller Williams is a Florida Realtor® whose goal is to help as many people as possible learn how they can become homeowners and help them successfully navigate through the home buying process to realizing the American Dream. Headquartered in Jacksonville, FL, M. "Nicole" Williams-Lewis is committed to the interests of your audience with services available throughout Florida. For additional information, please visit http://www.homegoalswithnicole.com.